Veronica and Herbert, both 20 years old, have already been together six years and married for two. Helbert is currently serving his mandatory military service, for which he is stationed at a military barracks until June 2017 and unable to earn an income to sustain his young family. In the meantime, Veronica and their 24-month-old son, José Esteban, are living with Verónica’s parents and her five younger siblings. The household of nine is solely supported by Veronica’s father, Hernán, a taxi driver who spends his days crisscrossing the bustling cities of El Alto, where they live, and La Paz, the neighboring Bolivian capital. José Esteban received a preliminary diagnosis of heart disease through the government-assigned pediatrician he visits as part of Bolivia’s essential healthcare program for infants through age five. 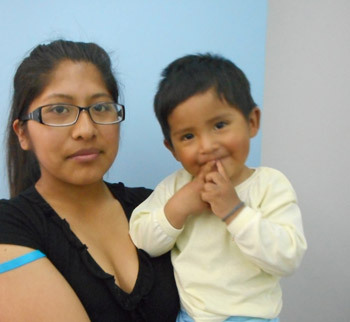 The program does not cover complex surgical needs, so the family visited the La Paz office of a German-supported program, Kardiocentrum, which in turn referred the toddler for further evaluation at the Incor Clinic in Santa Cruz. There, he was approved for treatment within the March 2017 cardiac catheterization campaign. The family knows no one in Santa Cruz, so Veronica and her mother, Ponciana, opted to sleep under José Esteban’s hospital bed until they could return home after his procedure. Veronica is grateful to all those who made her son’s treatment possible: Now he can grow as a normal child! … Many thanks to all the institutions who are supporting us.